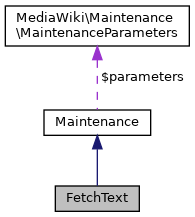 Maintenance script used to fetch page text in a subprocess. Definition at line 36 of file fetchText.php. Definition at line 38 of file fetchText.php. Definition at line 65 of file fetchText.php. References $line, getBlobStore(), Maintenance\getStdin(), and Maintenance\output(). Definition at line 51 of file fetchText.php.